Experience natural, effective chiropractic care for the entire family at all ages and stages of life. Feel fantastic and enjoy optimal health! 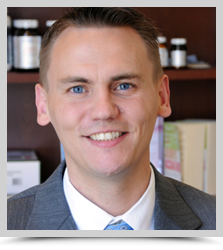 Mason City chiropractor Dr. Patrick Trenary and the staff at Active Family Chiropractic welcome you to our office. Our patients range from newborns to the elderly and include people from all walks of life. We are a family practice that feels like family. You’ll be cared for in a warm, friendly environment so you will always feel comfortable. Our goal is to help you be free from pain and experience life to the fullest. Although many of our patients first see us for immediate pain relief, chiropractic is more than just getting rid of pain. Dr. Trenary looks to resolve the underlying dysfunction, eliminating the pain and, more importantly, restoring function. We want everything to perform the best it possibly can. Chiropractic is also helpful for conditions that don’t cause any pain at all. Sometimes, a misalignment of the spine or a joint that isn’t functioning properly can throw your nervous system out of whack, leading to other symptoms you might not think to relate to your joints. Dr. Trenary’s thorough examination and thoughtful treatment can identify problematic areas and help resolve a variety of conditions. We know you are busy, so we make things as convenient as possible to get you back to doing what you love. That’s why we offer on-site X-rays and Saturday appointments and accept most insurance plans. Find out how much better you can feel! Browse our site to learn more about Dr. Trenary and Active Family Chiropractic. Then, contact our office to get started on your personal journey to wellness. I had lower back pain for over a month. My husband immediately called Dr. Trenary and he scheduled me right away for the next day and time as my husband requested. I was impressed and happy! I really appreciated how much effort Dr. Trenary put into his overall assessment before he made any adjustments. I have been going to several different chiropractors over the years and never had one do such a thorough check! I was very impressed! Best chiropractor I have ever seen. Not only am I very impressed with your practice, the friends and clients I have referred are also very pleased. So glad to have a chiropractor in town again! Ashley is awesome!! I’ll keep coming back for my weekly massage. It has really helped my chronic pain.